With its quaint façade, the two-story red-brick photo gallery has an authentic Taiwanese feel to it. Wearing his customary hat and a smile, Juan is nearing 70—the age at which the Confucian Analects say one can “follow one’s heart without overstepping the mark”—and he does appear at ease and spontaneous. Many years ago he quit smoking and began declining unnecessary social engagements. Coffee and LPs are still necessities, as is playing with light and shadow via a camera lens. His life is simple but not casual, and this is just the kind of feeling you get when you enter the gallery that bears his name. 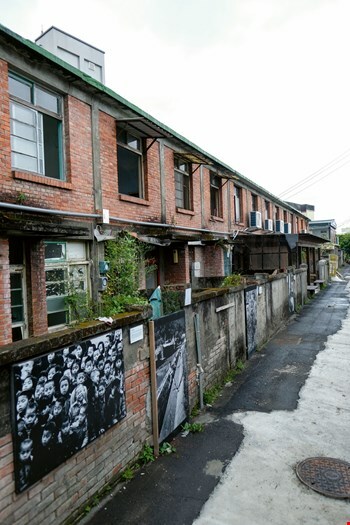 Located in Yi­lan City in an alley off Zhong­shan Road, the red-brick story house is hardly conspicuous, but as soon as you see a few large portrait photos hanging on the outside wall of the two-story building, then you know you’ve arrived at the site. 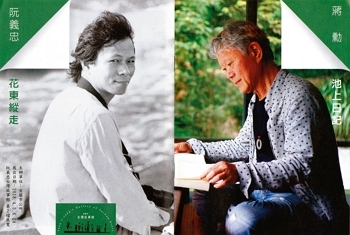 One photo looks a bit familiar, and upon closer examination it comes to me—this is Taiwanese author ­Hwang Chun-ming! His torso is unclothed, and he’s lighting a pipe. The interplay of light and shadow create a thought-provoking ambience. Oh, and that’s Lin Hwai-min, the founder of Cloud Gate Dance ­Theater. His robust, youthful body and guileless yet focused gaze are entirely devoted to his dance steps. Some 40 years ago Juan captured images of these personalities, whose names now resonate throughout Taiwanese society. These photos do not simply represent glorious recollections of that era; their display is also the raison d’être for his gallery. The site formerly housed residences for high-level officials of the post-war county government, explains gallery director Liu Mei-hua. But following the relocation of administrative agencies, the complex gradually deterior­ated. In 2015, after Yi­lan City’s mayor ­Chiang Tsung­-yuan took office, he moved to improve the surroundings and slated three of the original buildings for refurbishment. In 2017, Yi­lan Museum of Art invited Juan to return to his hometown and hold a retrospective exhibition. Given his ties to the place, he rummaged through his possessions in hopes of locating shots of Yi­lan never seen by the public. 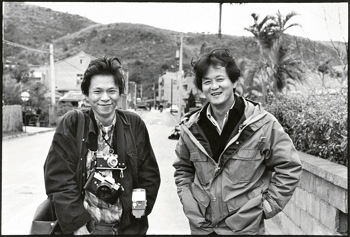 Themed “On the Way Home,” the exhibition was filled with images of Yi­lan during the 1970s and 80s. 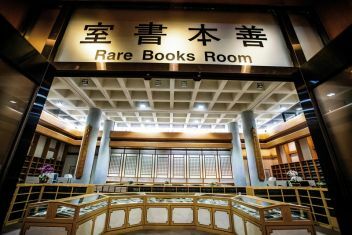 When the curtain came down on the well-received retrospective, Juan made it known to the museum management that “if there is a suitable place, I’m willing to relocate my atelier here.” Passed on by several people, those words eventually reached the ears of Liu Mei-hua, who immediately thought of the newly renovated buildings in “Fu­zhou Lane,”as the alley is known locally, it having once been inhabited mainly by people from Fu­zhou on the Chinese mainland. After examining it firsthand, Juan was very pleased with the space. “If you give me the whole row of houses,” he said to Mayor ­Chiang, “I can turn them into a gallery telling tales of Taiwan.” This kickstarted their collaboration. 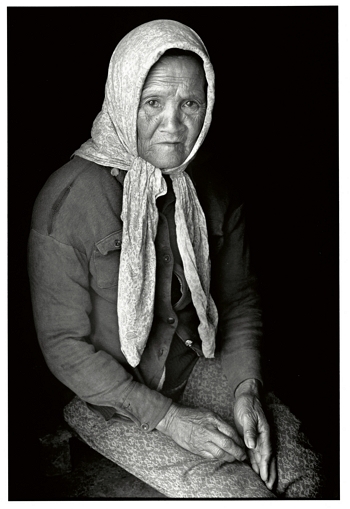 Person-to-person emotional connections, and those between people and the land, are constant themes of Juan’s photography. Over the years, his lens has documented the last glimpses of Taiwan’s agricultural society, one scene and one object at a time in black and white. Each photo has a story to tell, each shot is full of affection. 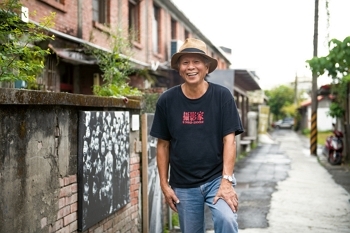 Born the son of a carpenter in Yilan County’s Tou­cheng Township, in the past Juan has said that his childhood was an impoverished one, a fact that made him want to flee his hometown. When he failed the island­wide university entrance exam, he went to Tai­pei to earn a living. Before picking up a camera, Juan wielded an artist’s brush to illus­trate novels and short stories for Youth Liter­ary Monthly. After compulsory military service, he served as an art editor for ECHO magazine, where he had a chance to put his camera to use. 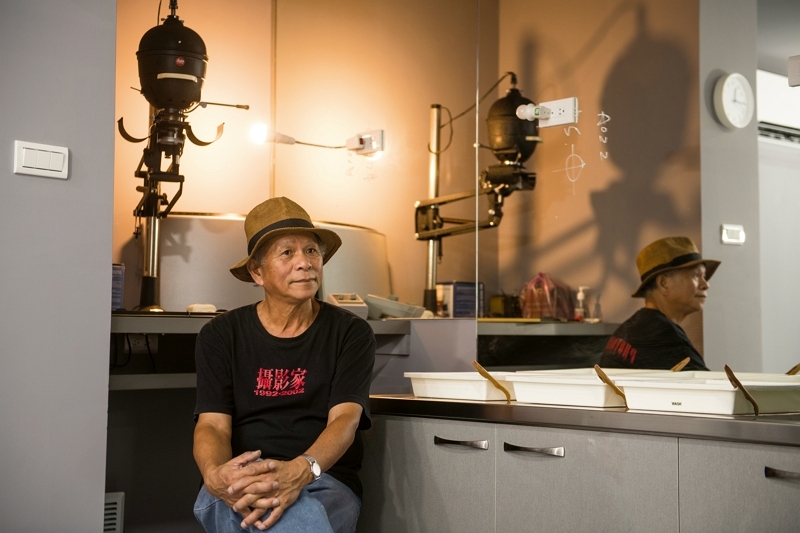 As photographer for Families from 1975, Juan carried his camera into all corners of Taiwan and shot large numbers of moving and precious images of people’s everyday lives. In 1999, in the wake of the September 21 Jiji Earthquake, he found that the towns and villages he had once visited had been ripped apart and residents traumatized. Following in the footsteps of volun­teers from the Tzu Chi Foundation, a Buddhist NGO, he recorded the reconstruction process, and once again ­experienced ­Nature’s power and humankind’s resili­ence. His photos appear in the collections Searching for Seeds of Hope and Awaiting Hope’s New Buds. These works are displayed on the gallery’s second floor. But his on­going authorship of published works such as Contemporary Master Photographers, A Day in the World: Juan I-jong’s Microblog 1 and A Master in Motion: Witness to Dharma Master Cheng Yen’s Compassion and Wisdom conveys that his talents are not restricted to photography. 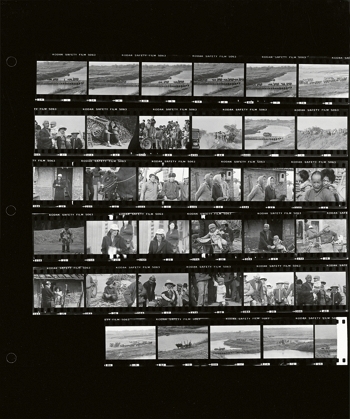 Another example is the influential bilingual magazine Photographers International, which he founded in 1992, and which has inspired photographers on both sides of the Taiwan Strait by introducing abundant works of professionals in the West, and helping domestic photo­graphers connect with trends in the world at large. The glass cabinet next to the bookcase shows the various cameras that Juan employed as his career progressed: the Nikkormat, when he was a novice at ECHO magazine; the Nikon F2 and trio of lenses (24, 50 and 105 mm) he called upon when trekking island-wide for Families; his first Leica IIIa, with which he photographed the young Lin Hwai-min; and others such as the Nikon F50 that he used to docu­ment reconstruction after the 921 Earthquake. For decades, Juan used a camera lens to record his quest for rural beauty and to reveal the intim­acy of people with the land. The first exhibition at the gallery was a joint event between Juan and ­Hwang Chun-ming. Although the two are Yi­lan County natives, they first met in Tai­pei. The latter is renowned as an author, but his photo­graphy is also outstanding. Juan has long treasured three rolls of film gifted him by ­Hwang some years ago, and given this op­por­tun­ity, he entered the dark­room and de­veloped the negatives personally. The theme of the photos is fishermen, farmers and indigenous peoples, the three kinds of working-class people that ­Hwang writes about. To initiate a dialogue with ­Hwang’s photos, Juan selected some of his own early photos of Taiwanese not­ables such as author Chen Yingzhen, songstress Fong Fei­fei and architect Han Pao-teh, from his collection The Known and the Unknown. The second exhibition was a dialogue between Juan and painter, poet and author ­Jiang Xun. In the autumn of 2014, ­Jiang became an artist-in-residence in southeast Taiwan’s Chi­shang Township, and Chi­shang Diary is a record of his moods. He used his mobile to photograph the landscapes he visited, such as picturesque Dapo Lake, tender green rice seedlings, and the golden paddies before harvest. 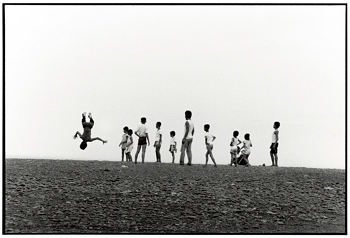 For his part Juan dug out some of the black-and-white photos he took on his 1979 treks throughout eastern Taiwan, featuring scenes from Hua­lien’s Feng­bin Township, including the seaside at ­Jingpu, children in sugarcane fields, and kids together with retired veterans. The third exhibition was a dialogue on architecture. Taiwan’s Li Chien­-lang is an expert in the study of ancient Chinese architecture. His eyes can “deconstruct” the inter­ior structure of buildings, and Tai­pei’s Long­shan Temple, the opera stage at the Lin Family Mansion in Tai­chung’s Wu­feng District, and Yu­san Hall in Chang­hua’s Yong­jing were all captured in his hand-drawn art, which features “cutaway” views. For this dialogue, Juan selected photos of the Lin Family’s Lai Garden that he executed during a 1977 visit. Many buildings in the area were destroyed in the 921 Earthquake, and although they were rebuilt, the flavor of the original compound, with its many courtyards, is now only to be found in photographs. The fourth exhibition grew out of an invitation for cooperation with Lee I-hung, who practices traditional Chinese ink-and-wash painting. His black-and-white photos, of woods, rocks or seaside, all convey an air of freehand landscape painting. For his part, Juan chose indoor color photographs featuring bright red tomatoes illuminated by sunlight, pottery placed next to a window and set off by the mountain forest outside, or a simple breakfast that has been laid out symmetrically. Each is a microcosm of the world, and in Juan’s deft hands, every­thing is art, every­thing is beautiful. Opera stage at the Lin Family Mansion in Wufeng: The juxtaposition of Juan I-jong’s photos (left, courtesy of Yilan City Office) and Li Chien-lang’s handpainted version (right, courtesy of Li Chien-lang) suggests the mansion’s rich history. Juan can cite in detail the thinking behind each exhibi­tion, and in his mind he already has long-term plans. 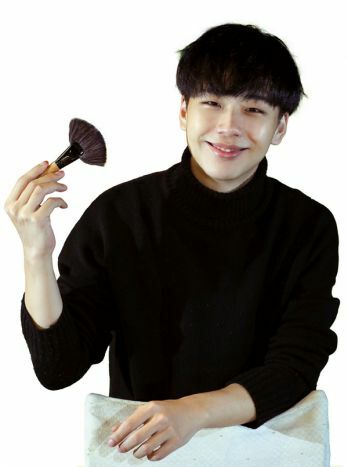 “I am too hardworking,” he says with a smile. “Based on my cache of previous photos, displaying ten years’ worth of exhibitions wouldn’t pose any difficulties.” For the first show in 2019, the “keyword” will be Tam­sui, where George Leslie Mackay began his work as doctor and Presbyterian missionary in 1872. Painter Chen Cheng­-po frequently visited Tam­sui in the mid-1930s, and left behind many landscapes featuring local scenery. Of course, the little town captured in Juan’s photos of Tam­sui from the 1970s can’t compare with today’s city. The photos he dug out from the bottom of his boxes will remind the public of Tam­sui’s former appearance. This is a three-way conversation that aims to remind society of those who once made a contribution to Taiwan. Since the gallery’s opening more than a year ago, thanks to Juan’s overseas reputation the guestbook bears the signatures of visitors from places such as Malaysia, Thailand, the Philippines, mainland China and South Korea. Schools use fieldtrips to the gallery as opportuni­ties for education in aesthetics and in life, says Liu Mei-hua. 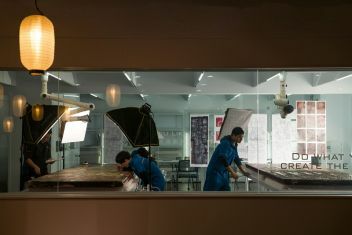 Volunteer Shen Mei­hua invites each visitor to discuss the photography and share their impressions with others. ­Zhang Jing­hua, another volunteer, notes that upon entering, many Yilan-­born people who have been away for many years gaze intently at the photos, which often evoke their childhood memories. As the gallery celebrates its first anniversary, in the old district of Yi­lan there is now a low-profile space where many a tale of Taiwan is recounted. It is the pride of Yi­lan and the good fortune of Taiwan.